Many street-goers seem to have lost their smiles. Any accidental interaction with another fellow burgher is likely to be perceived as a mild trespass. A genuine smile is a small physiological and social miracle that affords both its donor and beneficiary a healthy dose of positive emotions. It seems the grunt has ousted the grin! The aim of the event GIVE A SMILE FOR THE NEEDY is to fight this smile depletion situation in our population, and will take place in june as a part of “48 Stunden NeuKölln/Kunst rettet die Welt”. *This mutual obliviousness is further compounded by technologies. As I further observed, commuters all seem to be absorbed by their smartphone/headphones, sheltered from their actual surroundings by some external source of entertaiment/distraction. It is as if our presence within the public sphere has become bereft of its psycho-social dimension, the latter being instead set aside to be shown groomed and dramatised as web-presence. This dissociation of physicallity through technology is rising steadily. For instance, as I have further observed, it has become practically rude to call people on the telephone. Text, instant-messaging, FaceBook/social platforms, Skype and email are gradually replacing telephonic vocal contact in the personal social context: even the disembodied telephone caller is now often perceived as an intruder. A Duchenne (or genuine) smile engages the muscles around the mouth and eyes. 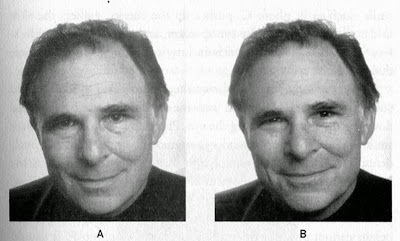 The Pan Am smile, also known as the “Botox smile”, is the name given to a fake smile, in which only thezygomatic major muscle is voluntarily contracted to show politeness. It is named after the airline Pan American World Airways which became defunct in 1991, whose flight attendants would always flash every jet-setter the same perfunctory smile.